To know your expiry date of your account subscription, simply login your senangPay Dashboard. 1. Click on the menu “Settings”. 2. Click on the submenu “Subscription”. 3. 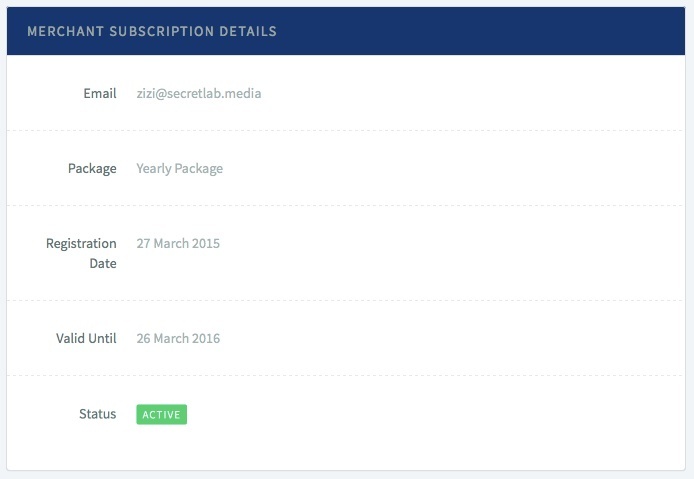 You will see a detail of your subscription. 4. To know your expiry date, refer to the “Valid Until” section. 5. If your account is active, you will see a green “Active” button. 6. If your account is inactive (due to fraud, etc) you will never be able to login to your account at all. 7. If your account is suspended, you will see a yellow “Suspended” button. 1. senangPay will email you a notification note to make payment on your expired date of subscription. 2. senangPay will only suspend your account if there is no payment made 7 days after the expiry date.